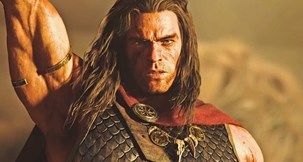 Conan Unconquered is the latest RTS from Petroglyph, and that fact alone is enough to get us excited about it. The team at Petroglyph include veterans from Westwood Studios who worked on Command & Conquer and Dune 2 (so helped create the entire RTS genre), and as Petroglyph made the excellent Star Wars: Empire at War and Grey Goo, we’ll pay attention to anything they do. 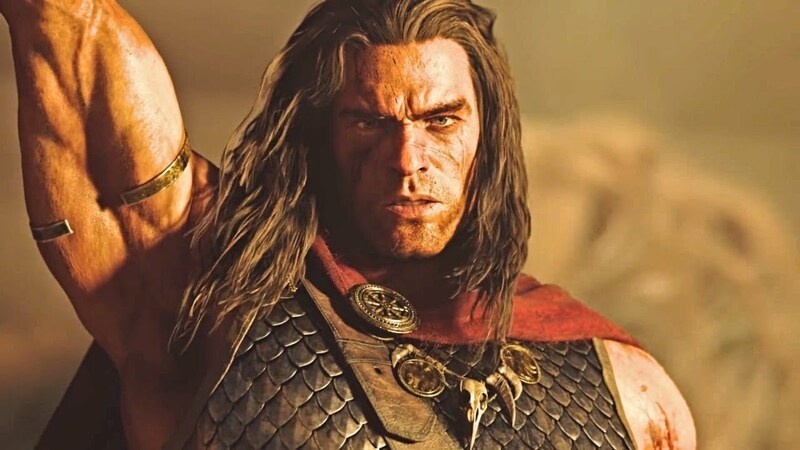 We got a chance to get a hands-on with Conan Unconquered at EGX Rezzed, and it’s a little different from the studio’s past games. 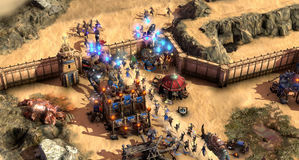 It’s a survival RTS in the style of Frostpunk or They Are Billions, in that you’re under continuous assault, and you’ve got to see how long you can survive. Let’s take a look. We were thrown into a custom game of Conan Unconquered with nothing but a keep, a bit of money, and Conan the Barbarian to our name. From here we’d have to build up an empire before we all get slaughtered. The goal is generally to survive for as long as you can, with increasingly difficult waves of enemies attacking at intervals. 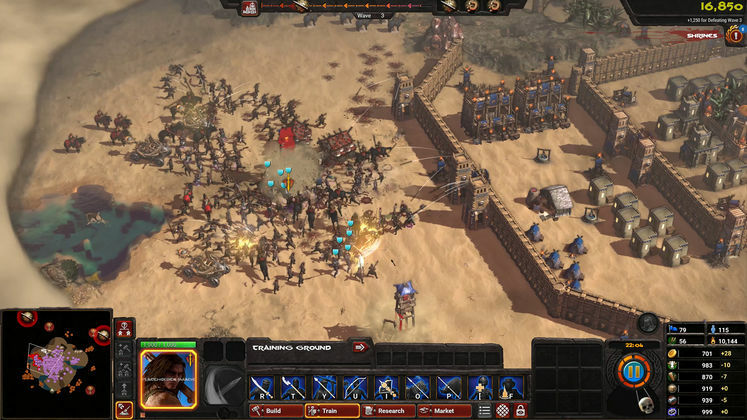 The game makes very clear which direction the waves are coming from, what unit types you’ll be facing, and generally how long it’ll take them to show up on your doorstep, so you have chance to prepare. Conan himself can take care of the first couple of waves all by himself, but after that things get progressively more difficult. Conan (and the other hero units) can level up for new abilities and strength, but they don’t heal over time. At the very least they can’t die - if they fall in battle they’ll resurrect at your keep after 60 seconds, which is an eternity if you’re under attack. Our Conan fell a lot, so believe us when we say that. 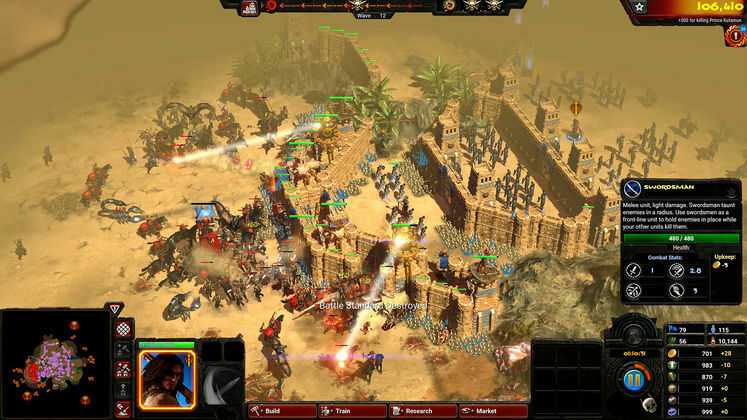 The general idea is that you should be building your base as much as possible between waves, as well as your army. Your main concern other than, y’know, war, is in keeping your stocks of resources up. There are actually 6 resources to gather and 4 stats, which stay constant but can be raised with buildings. Resources include wood, stone, and gold, and stats include people, command points, and food levels. Resources can be drained depending upkeep of people and buildings, otherwise they’re mainly used to buy things or upgrade buildings. You have three building types - resources, upgrades, and defensive. You start by building hovels for people to live in, then from there you can start making buildings that get you more resources or increase your stats - which you’ll need to keep upping if you want to afford better upgrades. Plus, your army won’t be very big if you’ve only got 12 people in your camp. Of course building up an army and then sitting around waiting would get boring fast, so fortunately there are other things to do on the map. There are enemy camps, with opponents such as bandits, scorpions, and, um, ostriches, and if you clean them out you’ll get a stack of resources as a reward. There’s even a special boss monster marked on the map, that presumably you’ll get a lot of rewards for defeating. We say "presumably" because we sent Conan and our entire army up against a Risen Inferno Lord, a fat fire demon, and we barely took 20% of his health off before he wiped me out completely. And that’s how our demo ended. 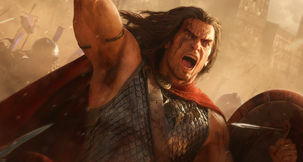 Conan Unconquered will release on PC on May 30, with a standard and Deluxe edition with a couple of new DLC units. And yes, it will be on Steam. Conan Unconquered is shaping up to be a fun but incredibly tough game. 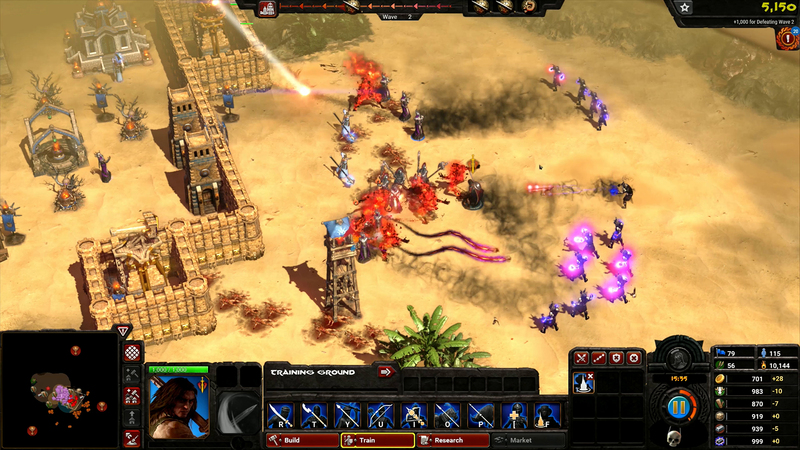 Even if we hadn’t thrown all our forces at that inferno demon and left our base undefended we still were on the cusp of defeat, as the previous raid had brought giant spiders, scorpions, and necromancers with it which we’d only barely defended against. Nevertheless, it’ll be fun to try, and once we get a bit more competent with the interface, knowing what resources to gather, levelling up Conan a bit, and actually doing some research this time (hey, it was our first time playing) maybe we’d last a bit longer. We’re certainly eager to try the story campaign, which still will be a survival RTS - but hopefully it’ll be a bit more forgiving. Gulp. The story campaign, or summoning gods on to the battlefield and watching them stomp over our enemies. Chris joined us in 2011 and loves Star Wars, comics and bad videogame movies.